We are very excited to announce the release of IDX Pages – a new feature for our dsIDXpress WordPress IDX plugin! Our existing “Link Builder” tool allowed you to build IDX links that filtered listings by criteria such as areas (cities, communities, tracts), property types, price ranges, beds/baths, and more. In some cases, these custom dsIDXpress links could get quite lengthy! Our new IDX Pages feature was built to help tackle that issue and improve the overall SEO efficacy of these links you’ll create today and into the future. You’ll need to upgrade to the newest version of dsIDXpress that we just released today. And once you do you’ll see a brand new feature and section called “IDX Pages”. 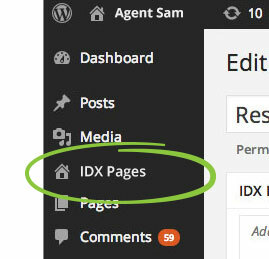 You can see that “IDX Pages” will be housed just above your regular WordPress Pages section making it very easy to find. The new IDX Pages are essentially WordPress Pages as well but they have built in functionality that allow you to build pages specifically to showcase properties for sale based upon specific criteria. In addition, because these are actual WordPress Pages you give each page a title. This title will become the link for your new IDX Page. Rather than using the previous link builder tool we can now select “Add New” under IDX Pages, write a title such as “Luxury Miami Condos for Sale”, and then using the link builder within the new IDX page, select the area, price point, and property type. … and each page is saved as a dsIDXpress link that you can use and reuse throughout your website! Please note: the previous link building tool will continue to be available. Additionally, all previously built links will continue to function as-is. This new tool will only affect new links that you build. Please let us know what you think of this new feature! We hope you’ll like it! This is a great new feature! I’ve been using as you mentioned with the long URL’s… Looking forward to custom URL’s to send people to automatically! Is there no way to add any custom content to the page? Hopefully this will be expanded upon? It seems promising but currently lacking in features.. sorry for the pessimistic view but I think I was probably doing better making my own custom page and then using the shortcode in it to display appropriate properties.. no? to add.. if this could be expanded to provide neighborhood information as well as other custom content then this feature would be more in line with some of the features other solutions have been coming out with..
Good, because half our links that bring results in the DS link builder, just bring an error once we use the link as a shortcode. And, I do hope we can “edit” these “pages” so they can replace our current community pages that have shortcodes that refuse to work. I am talking about integrating listings into pages, and I hope this will do this. I am attempting to use the new IDX page feature, which I think is great, but it appears to force a URL that includes /IDX/Listings/ in the URL. Your blog suggests I would have a “pretty” link without all of the preface. How is this competed? is this a permalink or some other method? I am having same problem. It is something to do with Permalinks. Does anyone respond to these posts? It would appear not. Did you attempt to address through permalinks? Customer Service got hold of me. /IDX/Listings/ will still be in the URL. So not as pretty as the blog suggests. Hello, it looks like we had a mistype in this post that didn’t express that idx/listings would be included in the page URLs created using IDX Pages. Our apologies for that. These links are definitely still very SEO friendly, though, and much more powerful than the links built in the past using our Link Builder tool. Unfortunately, at this time there is not a way to exclude this part of the URL from these pages.